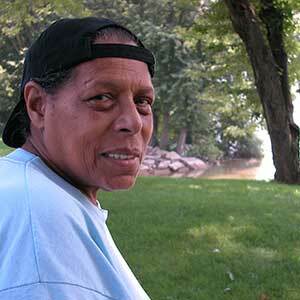 The audio stories and narration on this site are from oral history interviews with Mamie Sweeting Diggs, a native of Williamsport, PA and local historian. Mamie Sweeting Diggs was the fourth generation descendent of Daniel Hughes, a conductor on the Underground Railroad in Lycoming County, PA. Mrs. Diggs could often be found in schools, colleges, museums, libraries and any other place that people gather, telling the history and stories that were passed down from Daniel to his thirteen sons. Mamie's grandfather, Robert, helped his father, Daniel Hughes, hide escaped slaves in the caves behind their home on Freedom Road. They fed them, nursed the sick back to health and delivered them safely to the next "station." Robert passed the stories to his children, including Mamie's mother, Marion. Marion tended the family homestead, maintained Freedom Road Cemetery (where nine black Civil War vets are buried) and passed Daniel's stories down to her children. Mamie Sweeting Diggs refused to let the tradition end. She believed that future generations will be vulnerable to the possibility of history repeating itself if there is no understanding of what slavery and the struggle to end it cost her family and so many others. Mamie Sweeting Diggs spent years researching and documenting the stories she had heard since childhood and donated her research to the Lycoming College archives. Mrs. Diggs was responsible for much of the historical research on the WVIA video "Follow the North Star to Freedom" and her stories are featured on the Freedom Bound website. And probably most importantly, she personally brought history alive for multiple generations of school children in Lycoming County. Mamie was an honored guest, along with Harriet Tubman's great granddaughter, at the initial launch of the Freedom Schooner "Amistad" and has won a number of awards for her community service and storytelling, including an honorary doctorate from Lycoming College.